I can’t quite believe we’re here again! The John Lewis advert is out, lights are being strung around town, and elves are being delivered to homes ready to be put on the shelf. 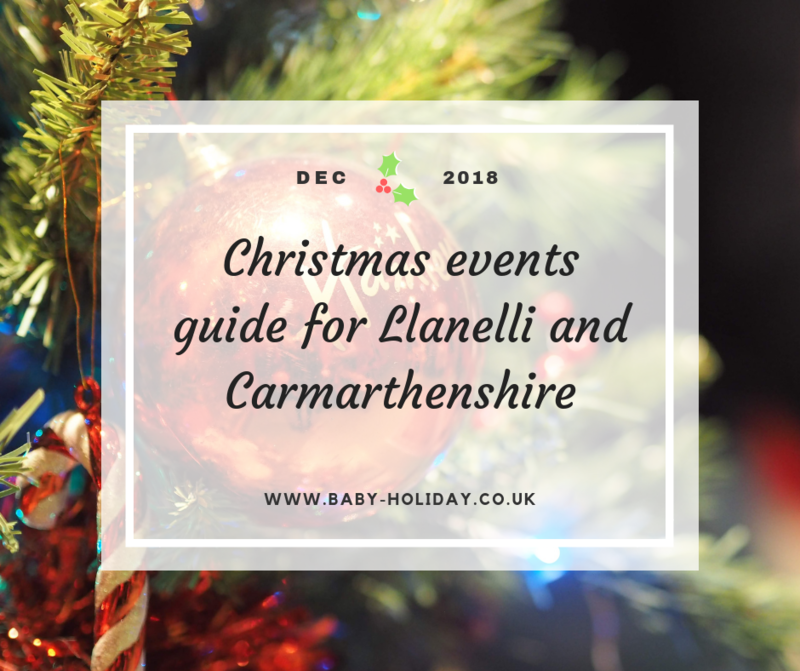 So it’s time for my Llanelli Christmas events guide 2018! There are a huge number of family-friendly Christmas events in Llanelli, Carmarthenshire and slightly further afield this December. From feeding the ducks with Santa Claus and visiting his grotto, to meeting his reindeer and singing carols, there won’t be a dull moment. Mark the start of the festive season with the Llanelli Christmas carnival and lights switch-on. There will be fairground rides in the town centre from 4pm, with live entertainment and music starting at 4.30pm. The carnival procession will leave Festival Fields at 6.15pm. The Christmas lights will be switched on at 6.45pm, and the carnival is expected to arrive at the town centre by 7pm, ready for the fireworks at 7.40pm. Ymlaen Llanelli & Llanelli Town Council are bringing the 2018 Reindeer Parade to town on Saturday, December 1. The famous Cairngorm reindeer from the Highlands of Scotland will be towing Santa through town – starting at 12 noon. They will leave from outside Ffwrnes Theatre in Park Street, and make their way through Park Street, Bridge Street, Vaughan Street, and Stepney Street before ending in Spring Gardens After the parade, Santa will head to his grotto in the Elli Shopping Centre, while there will be entertainment, rides and music in the town centre. Winter Wonderland is coming to Carmarthen this year, with an all-weather ice rink, funfair with family and extreme rides, gaming dome and festive food stalls. There’s also an alpine bar and karaoke booths set in private huts. From December 1, Father Christmas and his elves will be at the grotto. Entry to the grotto is £6. Drop in at the Oriel Myrddin Gallery in Church Lane between 10am and 12 noon to see Santa’s real life reindeer outside the gallery and make your very own sock puppet reindeer to take on the procession. From 2pm there will be entertainment from the Christmas Nutkins, Elvish – King of the Elves, Bouncy Elves, Festive Stiltwalkers as well as festive music and the Aladdin panto cast. See Santa with X Factor’s Reggie N Bollie switch on the lights at 5.30pm. 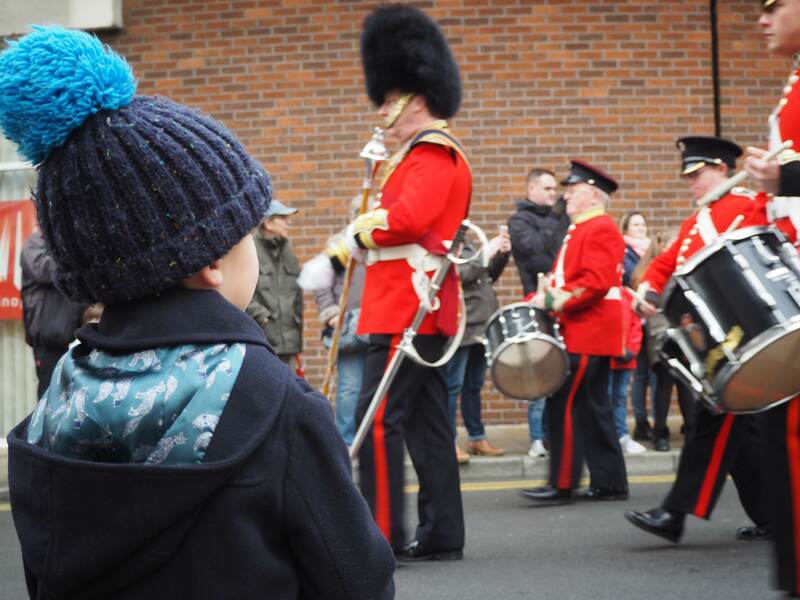 Parade departs Plas-y-Mor at 6pm to the Memorial Gardens followed by Christmas Fayre in the Memorial Hall. The Christmas lights will then be switched on. There will be carol singing, and refreshments on sale in the hall. Hand crafters will also be selling their products in the hall. Door entry is £1 for both adults and children. The annual Rotary Club grotto, which raises money for local charities, is coming back for 2018. Admission is £3, and funds raised will go to Ty Hafan, Burry Port RNLI, Glangwili Hospital baby unit and Welsh children’s cancer charity Latch. It’s days before Christmas, Santa and his Elves are very busy making lovely Christmas gifts for all the good boys and girls but he is so busy he needs some help. Santa and his elves will be popping by the park for a rest, and he might just have time to say hello to all the little boys and girls. Bring your letters along to post in the magic letterbox for Santa. Enjoy breakfast with Father Christmas at Llanelly House. There will be a festive activity and a chance to meet Santa. £10 per child. Visit Father Christmas in his grotto and take a ride on the trains at Mynydd Mawr. Train rides will be running from 10.30am to 3.10pm, with brakeman rides hauled by the Sentinel diesel locomotive. Snacks and refreshments will be available in the buffet car, including mulled wine and mince pies. £8 Adults / £7 Senior Citizens – two train rides a cup of mulled wine; £7 children – two train rides, *priority visit to Santa’s grotto and a gift from Santa. Infants under 12 months – two free train rides, you can pay £3.50 on day to visit Santa’s grotto. Join Santa as he takes a break from his busy preparations in the North Pole to help feed the birds. This is a magical experience for young and old – don’t forget your camera! Wheelchair and pushchair accessible. Travel on the steam train to visit a bilingual Father Christmas at Llwyfan Cerrig Station where a heated marquee with entertainment awaits you. Enjoy a mince pie and a tot of sherry while you wait to visit Santa in his grotto and the children can enjoy their goodie bags (for children 1-15yrs). Prices: Adult £12.95, child 1-15 years £9.50, infant (0-12 months) £6. Christmas will be in full swing in Dinefwr. With every Santa Sunday ticket purchased you will get to see Santa and Mrs Claus in their grotto and receive a gift, a glass of squash and a biscuit. £3 for children to see Santa, plus entry fee. As part of Aberglasney’s winter fair, Father Christmas will be visiting on Saturday and Sunday from 11am to 3pm. Wander through the sub-tropical indoor garden to find him! Garden admission is £8.50, and free for under 16s. Join Santa for breakfast, fun and games at Brewers Fayre. Not only will children get to meet Santa, there will also be Christmas activities, playtime in selected restaurants, a gift and breakfast. 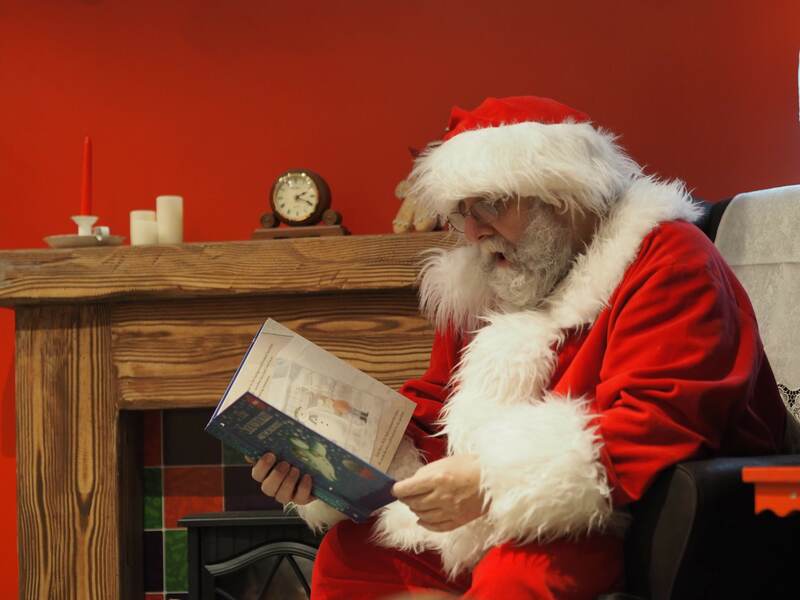 Enjoy a full welsh breakfast (carvery) followed by story time with Father Christmas. There will also be party games and crafts. £12.95 per adult,£8.95 per child. 100 minutes of festive family fun from Wales’ biggest touring pantomime. Adults £5, children £4. Saturday, December 8 and 15, 10am – 12 noon. £8.95 per child. Take a magic journey to the North Pole and meet your favourite characters along the way. Go down in your pyjamas – and don’t forget your favourite teddy! You will be met by the Polar Express Conductor who will take your tickets, and be good … maybe Santa will be around! Adults £7.50, children (under 16) £9.50. Jermin Productions returns with Aladdin – a family friendly pantomime for audiences of all ages! Offering the exotic delights of this Arabian night Pantomime, The Ffwrnes Theatre will be welcoming Aladdin to Llanelli, with a magnificent set, dazzling costumes and sensational cast. Thursday and Friday at 7pm, Saturday at 11am, 2pm and 6pm, Sunday at 2pm and 6pm, and Christmas Eve at 11am and 2pm. Winter Wonder World: Saturday and Sunday, December 8 and 9 at 11.30am and 2.30pm, in Theatr Botanica. The Last Quest: Saturday, December 15 at 11.30am, 2.30pm and 4.15 pm, and Sunday, December 16 at 11.30am and 2.30pm. A Promenade Performance. Ok, I know it’s after Christmas, but to me a pantomime is a festive event even if it’s in January! The ever-popular Jack and the Beanstalk by the Friendship Theatre Group, featuring Denny Twp. Join the cast as they try to help Jack and his mother Dame Trott defeat the giant Blunderbore. With guaranteed laughter throughout, spectacular costumes, wonderful scenery and breathtaking special effects . A pantomime not to be missed. Book early to avoid disappointment. Sunday, January 20 at 3pm will be a signed performance. The Festival of Senses is an annual pre Christmas festival. Located across the town of Llandeilo, the festival encompasses the towns shops, pubs, cafes and restaurants as well as offering craft and fashion stalls, food stalls and entertainment. Independent stall holders selling Christmas gifts, food and drink. The mansion and courtyard will be filled with tasty treats and gift ideas for all the family. Get into the festive spirit awithcarol singers, choirs and brass bands, and sip on a luxury hot chocolate or a glass of mulled wine. Browse the craft stalls for Christmas gifts, while enjoying music from school choirs singing carols, and entertainment from performance groups. Santa and his reindeer will also be around for the weekend. Entry fees apply. A Christmas Fair at Parc y Bocs farm shop in Kidwelly. Ffwrnes will host a craft fair every Monday from December 3 to 17, featuring stalls from local crafts people and small business owners. Confirmed stallholders include Tinworks Brewery, Knitting Club, Calonogi, John St Gallery, Purah, Ty Carreg Cookies, Cwtch Chocolate, Welsh Slate. There will be more than 60 stalls selling a wide range of gifts, from ceramics and glass art, to decorations and bird boxes, and 30 food stalls to choose from. There will be music and dance events through the weekend, plus visits from Father Christmas (see above for details). The Waterfront Winterland, in the grounds of the Waterfront Museum, has something for all the family with ice skating, funfair and festive food. The elves are waiting excitedly to welcome children and take them to meet Santa. On the way, you’ll take a journey through a winter wonderland, complete with a family of polar bears relaxing in the snow, trees that spring into life and speak, elves busy making toys, and Santa’s sleigh, which you can hop in to really feel the magic. At the end of your adventure and possibly after a snow shower or two, you will meet Father Christmas and his reindeer. Standard tickets cos £4 for adults and £9 for children (or £22 for a family). VIP tickets (includes a list to Mother Christmas’s room, reindeer food, hot chocolate, mince pie and a goodie bag) costs £8 for adults, £18 for children or £44 for a family ticket (2 adults and 2 children). The North Pole has arrived! Mrs Claus and her elves have taken over the pier, and will help each child to complete their letter to Santa. They will then visit Santa in his grotto, being given a golden key to the toyshop where the elves will be waiting to pick out a gift. Child ticket: £8.95, adults don’t need a ticket. Enjoy a meal at the Gower Heritage Centre and meet Father Christmas. Entry is £12.50 for children and adults, which includes a choice of meal (turkey dinosaurs, sausage, nuggets or pizza for children, and a turkey roll for adults), a gift for children and mulled wine or cider for adults. Watch Santa feed the deer at Margam Country Park, followed by activities in the castle. You can also visit the children’s village, the adventure playground and farm trail, and enjoy a winter walk in the park Warm up with a coffee and mince pie. Arrive at 10.30am for an 11am start. 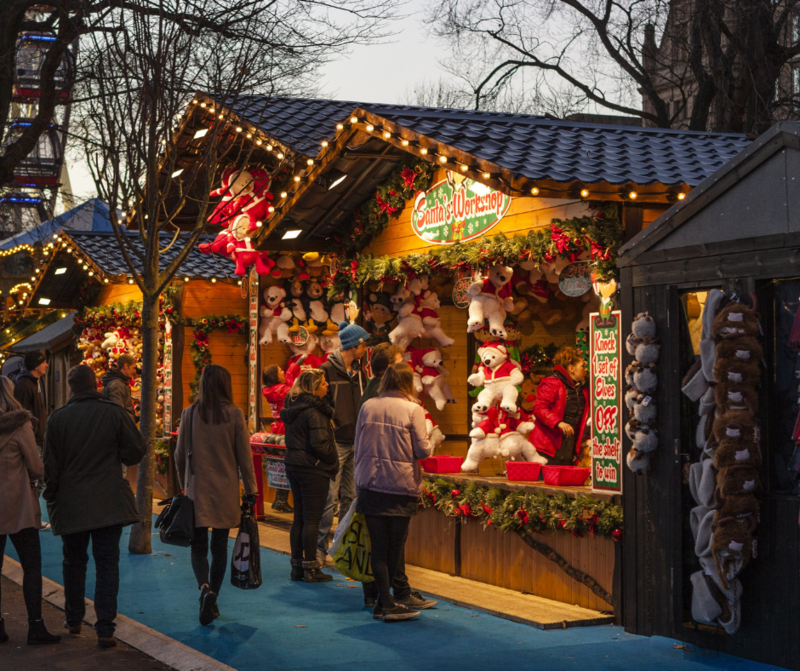 Cardiff’s Winter Wonderland is back for 2018 with the ultimate Christmas experience, including undercover ice skating, fun fair attractions, food, drink and plenty of Christmas cheer! We’ll be visiting soon, so check back to see how we get on! Grab a torch, wrap up warm and follow the star to St Fagans. There’ll be performances of Wales’ unique Christmas traditions, logs on the fire, carols in the chapel, and a brass band on Gwalia Green. For little ones, there’ll be a chance to meet Father Christmas, write their Christmas list at the Victorian Schoolhouse then pop it in the box at the post office. Ride the Christmas land train to meet Mother Christmas in her kitchen. There are also craft sessions – including wreath making for adults – and as the evening draws to a close there will be carols. Follow in the footsteps of your rugby heroes as we explore the halls in search for Santa Claus and the magical Christmas grotto. As you wander through the stadium halls and historic rooms picking up vital clues along the way, the sights and sounds will immerse you into the world of Welsh rugby that will be an adventure for the whole family, not just for kids. Feel the buzz of the Ray Gravell press room and stand in the footsteps of International players in the team changing room before completing the last piece of the puzzle and discovering the entrance to Santa’s Grotto! We’ll also be reviewing this in a couple of weeks, so pop back! As you can see, there’s plenty going on! From Llanelli Christmas events, to further afield, you’re guaranteed to get into the festive spirit!